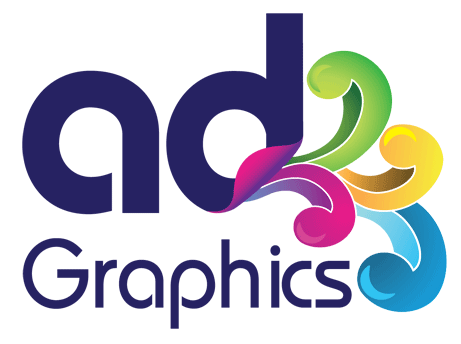 AD Graphics started as a sign only company in France and has extensive knowledge of the industry sector. The word sign is very general and can be used to define everything from a finger sign on a post to an office nameplate. Our main focus when making a sign is always how can we pass on the message correctly to the target audience, in budget and in the most ecological way in line with the customer brief. Signage is the way a company communicates to their customer, at a glance so your customer knows who you are and what you do. When a customer asks us for a front shop or factory sign, we send a surveyor who will have a look at the building and take some measurements in order to ensure the best fit possible. Our graphic designers will then create a visual from the sizes taken during the survey. Only when the graphic design and the choice of materials have been approved by the customer, will the manufacture start. Time of delivery depends entirely on how technical the project is. Shop signs can be made of anything from flat wood panels to aluminium trays, Fret cut letters fitted directly to the wall to lightboxes, architectural letters in stainless steel to acrylic letters. 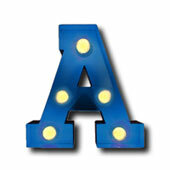 Illuminated with a Troughlight, neon, L.E.D. 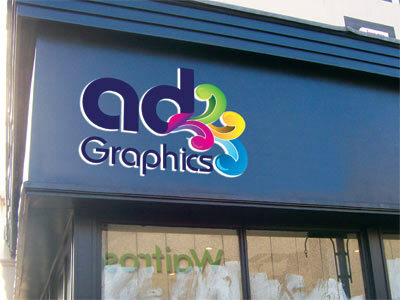 we can help you to choose the best option for your shop front sign. If you already have your sign in place, we can also produce some stunning projecting signs, pavement signs, window graphics, flags, boards or indoor graphics to enhance it. 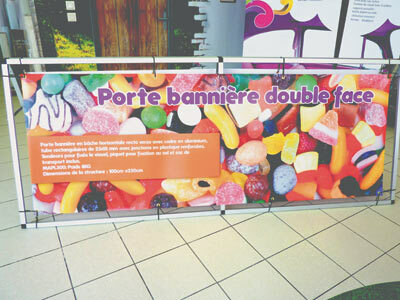 As temporary or portable signs, digitally printed banners are very versatile. On a sports ground, as a promotional message or on scaffolding to advertise your company, banners can be made in PVC or for bigger surface in Mesh to avoid wind resistance. From your external directory, parking signs to your internal directory and door nameplates, we can assist you from the graphic concept all the way through to installation. We are working with the standard aluminium slat system or with other materials like Foamex, Dibond, Aluminium panel and Perspex. 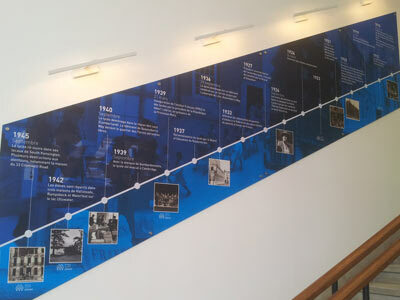 We also provide internal signs for schools and hospitals. Our signage is laminated with an Antimicrobial Laminate which contains antimicrobial agents that are designed for protection of surfaces against infections such as E.Coli, MRSA & Providencia Stuartii. Internal signage doesn’t have to be a board on a wall, we think that floor and wall graphics are under used and are able to transform your office or workshop into a creative working place. Metal options are also available, cut to shape letters, powder coated metal signs and very modern metal fixings. 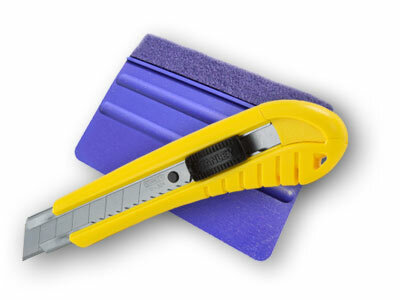 We can send your order anywhere in the UK for small items. The dispatch time will depend on the order but we will always do our best to accommodate your deadline. We quote for fitting independently as we know that no place is the same and a lot of factors have to be taken in consideration. Is the sign going to be high? Do we need a cherry picker or scaffolding? How strong is the structure which is going to hold the main sign? We want to make sure that when a sign is going up, it stays there. We cover so many areas that it’s difficult to summarise everything we do in a few lines, however we encourage you to drop us a line if you have a project as we are passionate by our work. We look forward to hearing from you.